Purpose: To convince Philemon to forgive his runaway salve. Onesimus, and to accept him as a brother in the faith. Original audience: Philemon, who was probably a wealthy member of the Colossian church. Date written: Approximately A.D. 60, during Paul's first imprisonment in Rome, at about the same time Ephesians and Colossians were written. Setting: Slavery was very common in the Roman Empire, and evidently some Christians has slaves. Paul does not condemn the institution of slavery in his writings, but he makes a radical statement by calling this slave Philemon's brother in Christ. Key verses: "It seems Onesimus ran away for a little while so that you could have him back forever. He is no longer like a slave to you. He is more than s slave, for he is a beloved brother, especially to me. Now he will mean much more to you, both as a man and as a brother in the Lord" (1:15-16). Special features: This is a private personal letter to a friend. 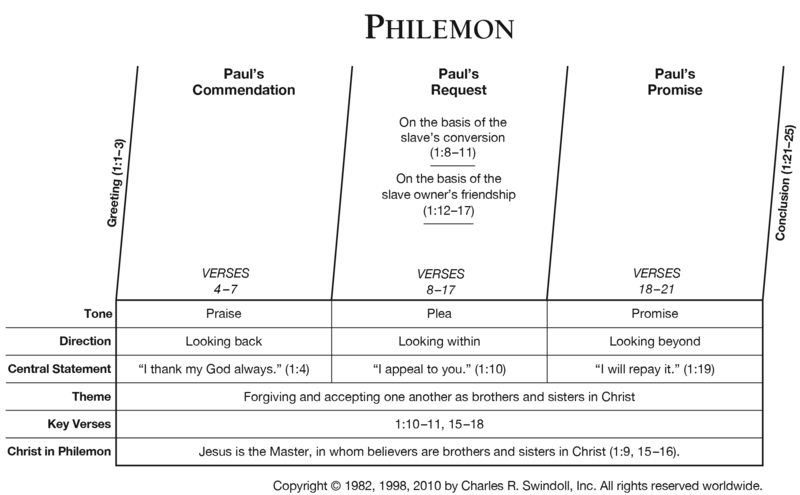 I. Paul’s Praise for Philemon (vv. 4–7). II. Paul’s Plea for Onesimus (vv. 8–16). III. Paul’s Pledge and Assurance (vv. 17–22). New Geneva study Bible. 1997, c1995 (electronic ed.) (Flm 1). Nashville: Thomas Nelson. Paul pleads on behalf of Onesimus, a runaway slave. Paul's intercession for him illustrates what Christ has done for us. As Paul interceded for a salve, so Christ intercedes for us, slaves to sin. As Onesimus was reconciled to Philemon, so we are reconciled to God through Christ. As Paul offered to pay the debts of a slave, so Christ paid our debt of sin. Like Onesimus, we must return to God our Master and serve him.